The ideas in HBO’s “Fahrenheit 451” are alarming in general, and even more so in the era of “fake news,” rampant abuse of personal information, and anti-intellectual fervor. But the experience of this “Fahrenheit 451,” which premieres Saturday at 8 p.m., is far less frightening. Despite the timeliness of a story about a government abolishing facts and rewriting history, the film never really jars. It has next to no emotional punch, so that it’s ultimately little more than a flat visual portrait of an ugly world sometime after a “Second Civil War.” The dystopian Hulu series “The Handmaid’s Tale” pulls you in with its complicated characters and with the fine details of its brutally misogynist country; you don’t just understand the tragic warning messages, you feel them deeply. 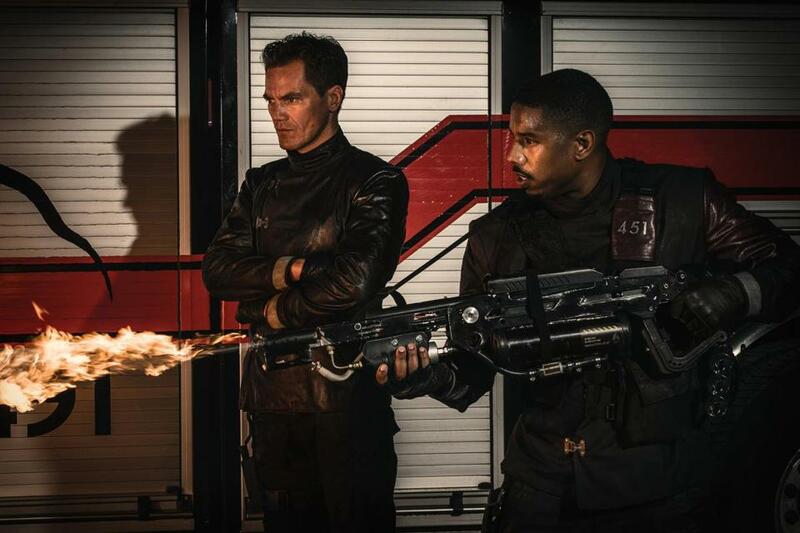 HBO’s “Fahrenheit 451,” directed by Ramin Bahrani, is as easy to brush off as “The Handmaid’s Tale” and a number of “Black Mirror” episodes are not. Bradbury’s tale hasn’t just been updated, with a newsfeed broadcast across skyscrapers; it has been streamlined, with significant characters from the book either minimized or dropped entirely, perhaps so that it could fit into a 90-minute slot. The result is a story boiled down to a husk, a simplistic statement enacted by one-note characters whose internal conflicts — when they exist — are underexplored. The book burners are bad, the eels are noble, and those who fall somewhere in between — notably our hero, fireman Guy Montag, played by Michael B. Jordan — don’t make any sense. Jordan, however, is the redeeming factor in the HBO movie. The script has Montag, so committed to the cause, suddenly questioning his actions after having flashbacks to his father, a reader. He goes so far as to grab a book — Dostoyevsky’s “Notes From the Underground” — from a burn and start to read it, defying his mentor, Captain Beatty, played by villain-du-jour Michael Shannon. We’re told that Montag is having a life transformation. But Bahrani’s script hardly accounts for or elaborates on his change of heart and his willingness to risk everything for his new cause. It happens because it’s a story pivot, that’s why. And yet Jordan brings a soulfulness to the part that helps to justify the shift. You can tell all along that he is working to quiet his own decency. You root for him when he diverges from Beatty because of the innocence Jordan exudes and the humanity he has found within. It’s written all over his face. Starring: Michael B. Jordan, Michael Shannon, Sofia Boutella, Khandi Alexander, Martin Donovan, Keir Dullea. On: HBO, Saturday at 8 p.m.
Matthew Gilbert can be reached at gilbert@globe.com. Follow him on Twitter @MatthewGilbert.